We are starting to close in on the main event, the expansive winter storm for the Midwest. We have been tracking this system for 5+ days now, and confidence is finally considerably high. Winter storm watches have already been posted for much of the threat area! Storm Summary: A major ridge has developed in the Southern Rockies, with a strong split flow in place. 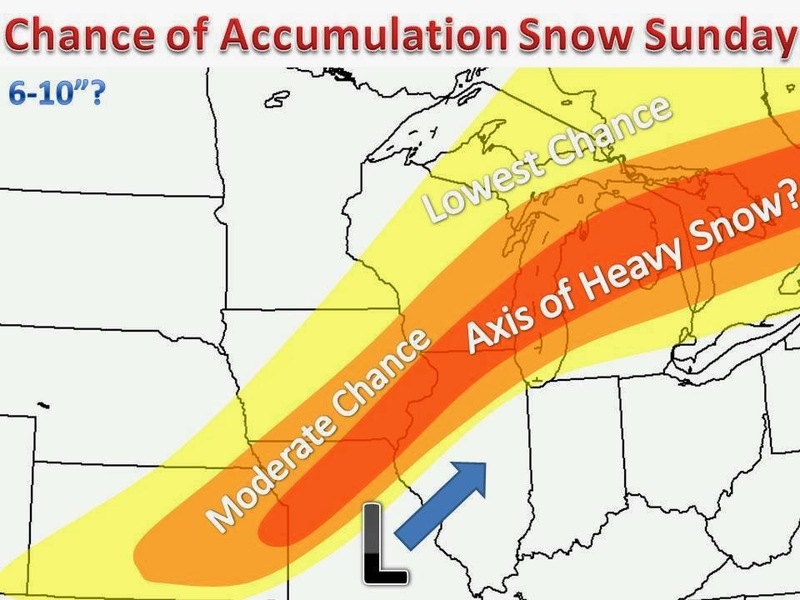 This feature is very conducive to winter storms in our area. With this pattern in place, a strong surface low pressure will develop near Texas and race northeast into northern Indiana by Sunday, dropping significant snows on the back side of the system. Forecast: The heaviest snow amounts still appear to be on the order of 6-10", where that exact band sets up is somewhat in question, as models are not fully in unison. However, our confidence is on the rise that this band will fall close to the red shaded area. With lesser amounts from there. We should have a preliminary snow map up tomorrow afternoon, as storm sampling comes in. We will sift through the data sets and map our interpretation. Stay tuned for that!